All the items are brand new ORIGINAL. 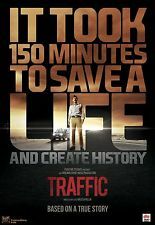 Story of Traffic, takes place over the course of a single day and is inspired by a real-life incident from Chennai, as shown in the credits. In Pune, superstar Dev Kapoor's daughter is sick and needs an urgent heart transplant. Elsewhere in Mumbai, trainee journalist Reyhan meets with an accident and is declared clinically dead. Reyhan's parents decide to donate his heart to Dev's daughter. However, rains and low visibility conditions make it impossible to transport the heart by air and the only option is to traverse the 150 km by road. Though initially apprehensive, Joint Traffic Commissioner Raghubir Singh accepts the challenge and seeks a volunteer from among his men to drive at 120 kph, through the busy Mumbai streets. Disgraced traffic constable godbole (who has just rejoined the force after being suspended for taking a bribe to help his sister) puts up his hand and thus begins the journey. He is joined by Reyhan's friend Rajeev and Dr Abel, a surgeon, who is battling his own personal demons..